Christian Heights United Methodist Church was supposed to have been built on a different site on North Drive. Mr. and Mrs. Emmett Hayden gave three acres of land across from the Hopkinsville Community College and two more acres were bought for $4,000. The deed was recorded on April 14, 1964. In 1966 the community was looking for land for the Animal Diagnostic Lab across from the college. Mr. Waldo Adams agreed to trade five acres of land on a knoll up the street for the land owned by Christian Heights and give the church $1,000. That deed was recorded on July 11, 1966. The Louisville Annual Conference of 1964 with Bishop W. C. Gumm presiding, assigned Rev. Jack Baird to the new church to be organized. A temporary church and parsonage was a rented building, the old 41 Inn on Highway 41 North. The first worship service was in September 1964 with 25 people attending. In November Rev. Baird was transferred to an organized church when their pastor died. The District Superintendent, Rev. G. P. Robertson, asked Rev. Fred Glover, a Christian County native who had retired at the 1964 Annual Conference and moved back home, to pastor the church. Rev. Glover and his wife, Lillian, were building a home on Sanderson Drive. Rev. Glover conducted the first service in the 41 Inn location on November 1, 1964. Rev. Robertson led the service that established the new Methodist church. The group moved to the Dawson Road location where they met until the new church was ready. In 1966 Rev. R. R. Guthrie became the pastor, but health problems caused him to leave, and Rev. Glover was asked to take over again in 1966. During Rev. Glover’s years as pastor, a great deal of progress was made. The first Sunday school was organized in November 1964 with four classes. Rev. Glover was the church school superintendent, Mary Boyd was the first secretary, Eva Joyce Sivells was pianist for the church school. Reba Sisk and Belva Nichols from St. John came over as pianists for church. The first Woman’s Society for Christian Service (now United Methodist Women) began in April 1965. This active group raised money for the new church, entertained District WSCS groups, promote missions, and led self-denial programs. Rev. Don Benningfield was assigned by the Annual Conference in May 1967. Rev. Glover continued to work in the congregation. Brother Don and his wife, Pat and son, Glenn, became the parsonage family. A committee began the final plans for the new building. The Church was to cost $57,000, including furniture, parking lot and grass. On October 20, 1968, there was a cornerstone laying service led by Brother Don and Rev. Glover. The first service in the new Christian Heights Methodist Church was held on November 3, 1968. Prior to the first service, communion and all-night prayer vigil were held. The formal opening and consecration service was on November 10, 1968. Soon after the new church was built a woman by the name of Inez Seeber drew a sketch of the church. Until the new addition was built Mrs. Seeber’s artwork was printed on the front of the church bulletins. Brother Don started the first choir, Men’s club, and youth group. 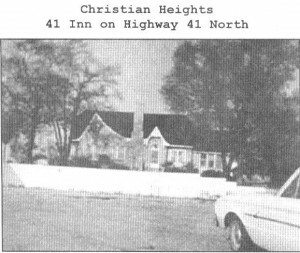 In August 1985 Christian Heights sold the original parsonage on Fairview Drive and the new parsonage at 803 North Drive was finished. Near the same time some land was sold from behind the church to the Masonic Hall. 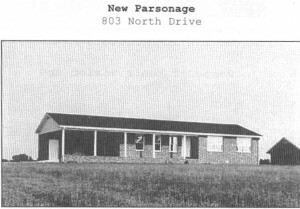 In 1990 the church began building a wing to add a new pastor’s office, library, multipurpose room, and additional classrooms which would include a nursery. The addition was made with a 25-year mortgage, just six years after the earlier mortgage was paid off. The church had set goals to pay this mortgage off in 10 years and with many dedicated individuals it well met this goal in December 1998. The first church website was created on August 11, 2000. The initiative to begin the website was Rev. David Combs’s. Eric Brake was selected to lead this new venture, while performing tasks such as updating the information contained in the website and deciding the design and layout. We hope to continue to use the website and the Internet at large as a powerful tool to spread God’s message well into the future. The people who are down. And call it Christian Heights. And face it toward the street. So simple, yet so neat.